The Northtown Trail is a smart, functional, bold and audacious plan that would likely help shape non-auto-dependent growth, reduce congestion on 29 and maybe help folks using it get more fit. It’s a shame it will probably never be built. The plan for the Northtown Trail (pdf) would be something special. The MPO adopted a final plan for the creation of a 14.1 mile long bike commuter trail spanning from northern Albemarle County to Charlottesville’s downtown mall. The Northtown Trail will be built in phases over many years as new transportation infrastructure is constructed. That will depend on the building of a new bridge to allow for the extension of Berkmar Drive across the Rivanna River. Earlier this month, the Albemarle Board of Supervisors opted against further consideration of a comprehensive plan amendment to bring land north of the river into the development area. Developer Wendell Wood had offered to pay for a portion of the road and bridge’s $25 million cost, but that plan is now in doubt without the expansion. The Northtown Trail is tied to several significant roadway projects in the area, including the Route 250 Interchange at McIntire Road, McIntire Road Extended, the Meadow Creek Parkway and Berkmar Drive Extended. 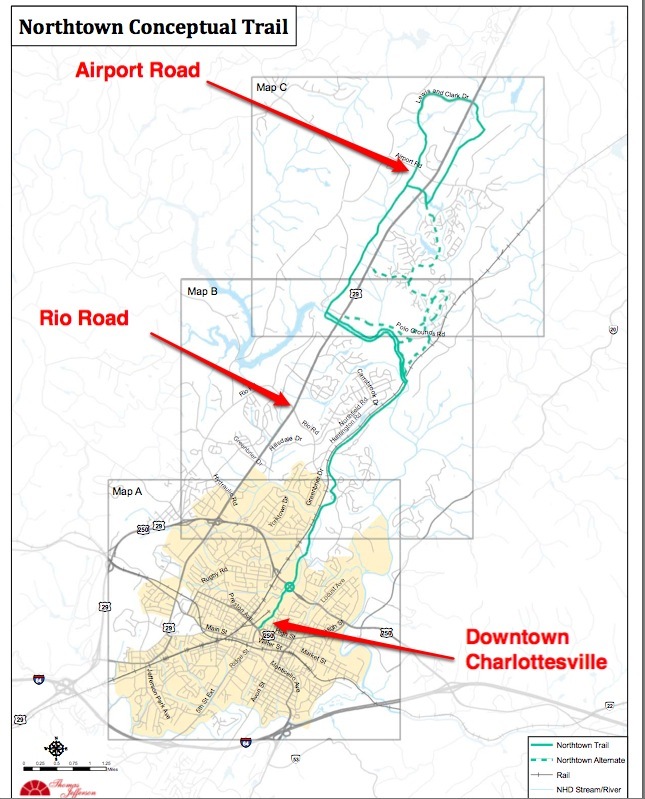 The portions of the trail in Albemarle County correspond directly to planned facilities for the Places29 Master Plan, which aims to improve congestion and land use issues along the US 29 north corridor in Albemarle County. Final approval of the Places29 Master Plan from the Albemarle County Board of Supervisors was still pending as of October 2010. The City’s portion of the conceptual trail corresponds to planned bike and pedestrian facilities along the future McIntire Road Extended and the Route 250 interchange at McIntire Road. Further, see pages 34 and 35 for maps specifically addressing the projects and respective funding needed to implement the Northtown Trail. The Meadowcreek Parkway has been discussed/planned/fought for and against for decades; basing any plan around its completion strikes me as hopeful/aspirational/absurd. Update 2 December 2010: Interesting discussion at the HooK about the merits of this pie-in-the-sky bike trail.